Add the crab shrimp, cream cheese, lemon juice to the bowl of a food processor. Pulse until a chunky combined consistency is reached. Add the mixture to small oven proof baking dish, sprinkle with bread crumbs, then dot with the butter. 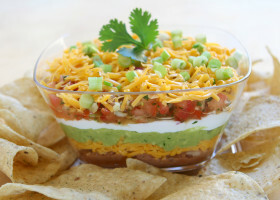 Bake for 45 to 60 minutes until the dip is bubbly and the topping is golden. Be sure to check half way through cooking.